Delfina Foundation’s partnership with Frieze involves four performances at this year’s fair. 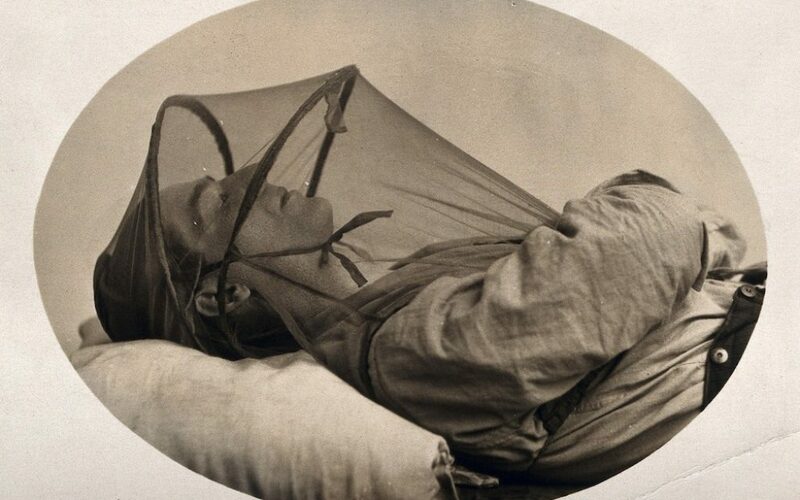 Mosquito headnet with armholes, covering upper body, modelled by a sleeping man, 1902-18. CC Wellcome Library. Courtesy Vivian Caccuri. Fair goers at this year’s Frieze London, 4 – 7 October, will have the chance to experience performances by Delfina Foundation residents Alex Baczynski-Jenkins, Vivian Caccuri, Liz Glynn and Pratchaya Phingthong. Delfina Foundation has partnered with Frieze LIVE to support the development of three artists’ presentations in the programme at the fair. Titled “Control ~” (“Control Tilde”) – a keyboard command that makes visible all formulas in a spreadsheet – this year’s programme is curated by Diana Campbell Betancourt (Samdani Art Foundation/Dhaka Art Summit) who has selected works by thirteen international artists, which will draw attention to unexpected connections and hidden formulas which impact wider social, political and economic realities. Vivian will be presenting a performative lecture, researched and developed during her residency, which looks at the relationship between humans and mosquitos and the stories of mosquito-based diseases and their history within colonialism. More here. Vivian’s 2018 residency is supported by Inclusartiz Institute. She is represented by A Gentil Carioca. Liz will be realising a new work at the fair called Fear Index, initiated during her residency at Delfina in sping 2018. Dancers within the space will move in response to dynamic flows of information from the fair itself, including sales, rumours about sales, volumes of people coming in and out. More here. Liz’s 2018 residency is supported by The Walton Family Foundation. She is represented by Paula Cooper Gallery. Pratchaya will be presenting an adaption of a work called Demonstrations, which he has developed during his current residency at Delfina. In 2008 Pratchaya used an artist fee to purchase 1,000 counterfeit bank notes from Thai farmers who were paid in this fake currency to participate in a political protest. Around the fair Thai students will be approaching visitors and sharing with them these notes and the story behind them. More here. Pratchaya’s 2018 residency is supported by Delfina Foundation’s Network of Asia Pacific Patrons. He is represented by GB Agency. In addition to the three Delfina residents participating in Frieze LIVE, Alex Baczynski-Jenkins, as winner of this year’s Frieze Artist Award, will be presenting a newly commissioned choreographic work – the prize for the accolade alongside a residency at Delfina Foundation. For the commission, Alex continues his choreographic practice engaging with queer relationality and the politics of desire, intimacy and friendship. The performance will take place intermittently throughout the fair’s opening hours, inside an enclosed sonic environment – between booths B2 and B3, designed to evoke a liminal space between white cube and black box. A neon sign created by the Warsaw-based feminist and queer collective Kem – of which the artist is co-founder and member – will be installed above the room’s entrance and switched on to indicate when the performance is happening. In the work, Alex draws on the box step, a basic movement used in several social dances, to create a choreography that explores collectivity, subjectivity, queer embodiment and desire. Synchronised movements co-exist with moments of slippage and letting go, each body playing host to individual and shared affections. In this altered state, the box step becomes a container for the relational force that resides in moving with others.